Plant pathologist Ioannis Stergiopoulos says discovery of how three fungal diseases attack banana plants should be a “wake-up call” to the research community. Researchers at the University of California, Davis, and in the Netherlands have discovered how three fungal diseases have evolved into a lethal threat to the world’s bananas. The discovery, reported in the online journal PLOS Genetics, better equips researchers to develop hardier, disease-resistant banana plants and more effective disease-prevention treatments. “We have demonstrated that two of the three most serious banana fungal diseases have become more virulent by increasing their ability to manipulate the banana’s metabolic pathways and make use of its nutrients,” said UC Davis plant pathologist Ioannis Stergiopoulos, who led the effort to sequence two of the fungal genomes. The banana is one of the world’s top five staple foods. About 100 million tons of bananas are produced annually in nearly 120 countries. But the fruit suffers from an “image problem,” giving consumers the appearance that it is and always will be readily available, said Stergiopoulos. It’s an image problem that he fears could prove fatal to the entire banana industry in the very near future. In reality, the global banana industry could be wiped out in just five to 10 years by fast-advancing fungal diseases. And that would prove devastating to millions of small-scale farmers who depend on the fruit for food, fiber and income. Already, Sigatoka — a three-fungus disease complex — reduces banana yields by 40 percent. The Sigatoka complex’s three fungal diseases — yellow Sigatoka (Pseudocercospora musae), eumusae leaf spot (Pseudocercospora eumusae) and black Sigatoka (Pseudocercospora figiensis) — emerged as destructive pathogens in just the last century. Eumusae leaf spot and black Sigatoka are now the most devastating, with black Sigatoka posing the greatest constraint to banana production worldwide. The constant threat of the disease requires farmers to make 50 fungicide applications to their banana crops each year to control the disease. And for those growers who can afford fungicide, the applications pose environmental and human-health risks. To make matters worse, all commercial “dessert” bananas — those most commonly found in grocery stores — are of the Cavendish variety. And unlike a tomato or green bean, which are grown from seeds, bananas are grown from shoot cuttings. 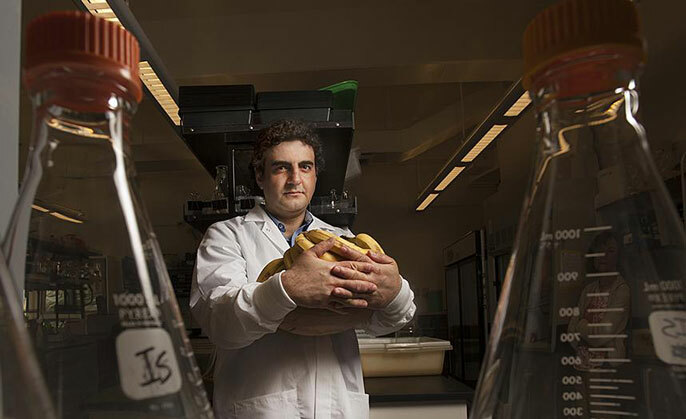 “The Cavendish banana plants all originated from one plant and so as clones, they all have the same genotype — and that is a recipe for disaster,” Stergiopoulos said, noting that a disease capable of killing one plant could kill them all. Stergiopoulos and colleagues sequenced the genomes of eumusae leaf spot and black Sigatoka, comparing their findings with the previously sequenced yellow Sigatoka genome sequence. They discovered that this complex of diseases has become lethal to banana plants not just by shutting down the plant’s immune system but also by adapting the metabolism of the fungi to match that of the host plants. As a result, the attacking fungi can produce enzymes that break down the plant’s cell walls. This allows the fungi to feed on the plant’s sugars and other carbohydrates. “Now, for the first time, we know the genomic basis of virulence in these fungal diseases and the pattern by which these pathogens have evolved,” Stergiopoulos said. Financial support for the study was provided by UC Davis faculty startup funds.